Introducing the Pinkpolka Invitations & Stationery Collection, which offers all the style of our boutique design studio at a fraction of the price. Our ready-made wedding Collection offers 100+ designs to choose from, in a variety of categories that will suit your wedding style and theme! Local clients can schedule a consultation to view samples in-person. Some of our most popular Collection designs can also be viewed in our portfolio. The Collection includes customizations, such as coloured envelopes and metallic paper, that let you create your perfect wedding invitation set. Everything is print-to-order, which means you customize all the colours at no charge. 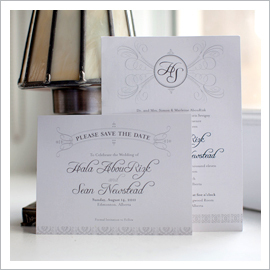 For a fee, you can also change the fonts, layout or style of the invitation. Coordinating reception stationery is also available so your visual theme can follow through to your wedding day. 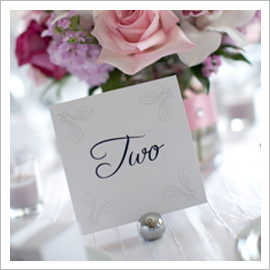 We offer everything from table numbers and seating charts to beautiful custom hard cover guest books. We understand not every couple fits into a standard design. For the couple that envisions something specific, we offer custom design with our Custom invitations. Tell us your vision of the perfect wedding stationery and we’ll transform those ideas into reality.